Preservation of fruits and vegetables has its deep roots in human history. From the days of the Romans who dried their dates and figs through adding heat in a smoking process to the salt used to preserve meat and vegetables, crucial in making the several month long journey across the Atlantic during the founding of the New World. Pickling has been around for probably around 4,000 years with its origins in India and the Tigris Valley where cucumbers were first pickled. Food preservation has long been a favored way to store our food, but why? BECAUSE PICKLING MAKES SENSE. When farmers had a successfull yield come harvest time, but didn't know what to do with their crop, they would sit down for dinner every night with the same old thing and dream of a new way to do vegetables. The remedy was science! That's right, the scientific process anaerobic fermentation that we know as "brining" or "pickling" is what occurs while your pickles soak in their acidic solution. Depriving the vegetables of oxygen and adding high levels of salinity and low temperatures causes some interesting science to happen in those jars. Leuconostoc mesenteroides dominate the solution, which causes acids and alcohols to pervade, and thereby good bacteria (lactic acid) is able to colonize your veggies. So you are essentially allowing the spread of bacteria! Scary huh? Nope. These microoganisms digest sugars in the pickle that control the spread of bad bacteria, eleminating a potential food source for them. Lactic acid also give pickles that sour taste that we all love. Pickling is revolutionary. Something somewhat mild in taste like cabbage can be entirely transformed when the right ingredients like spices and wine are added. After a fermentation process you have an entirely new dish like sauerkraut or kimchi that is popping with flavor. Flavor is but the tip of the iceberg. Today we can’t forget the many uses of the many different forms of food preservation. Drying, Fermenting, Freeze-drying, Pickling, and all forms of preservation have their place on our kitchen shelves and eventually into our bellies, whenever we see fit! That's the beauty of canning, once you have something canned its essentially no-worry. Let it rest and eat it when you want. 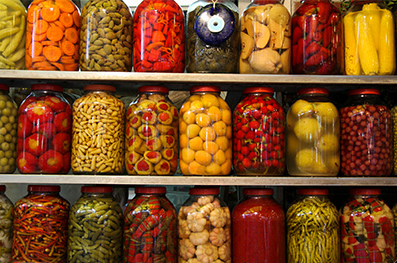 Most canned fruits and pickled vegetables can last well preserved and edible for months and even years. Canning and pickling ensure no waste and retains and even enhances the flavor whatever it is you’re preserving. We know it will come in handy come harvest season when we have extra veggies that we couldn’t bear to throw away. The process of pickling a vegetable does seem very foreign to most of us, but it’s really pretty easy. Different cultures use different techniques for pickling but the idea is generally the same throughout, high levels of salinity, the exclusion of oxygen from the process, and if you’re fermenting higher temperatures to kill any bacteria that can get in. Usually if you’re adding enough acidity to your vegetables, in the form of vinegar and salt, and keeping them at room temperature that should be enough to get you a standard pickled beet, cucumber, pepper, or whatever you crave! - Sterilize your lids and jars by rinsing them in boiling water. - Allow the jars to dry and cool, as you want to add your food at room temperature. - Add to your solution pickling additives that aid in preservation process and add flavor, i.e. salt, garlic, dill, and any other spices or additives you want to achieve your perfect pickled food. - Seal them up in jars tightly as to not allow oxygen in, this creates an environment where anaerobic fermentation can occur and beneficial bacteria will seep into your food and create that enjoyable sour “pickle” taste that we all know. We all think of pickled cucumbers when we think of “pickled” anything, but there’s much more to it than just cuc’s. Beets, onions, peppers, carrots, cabbage, and potatoes just to name a few tasty pickled veggies. Give it a shot if you just have too much of a harvest to go around!